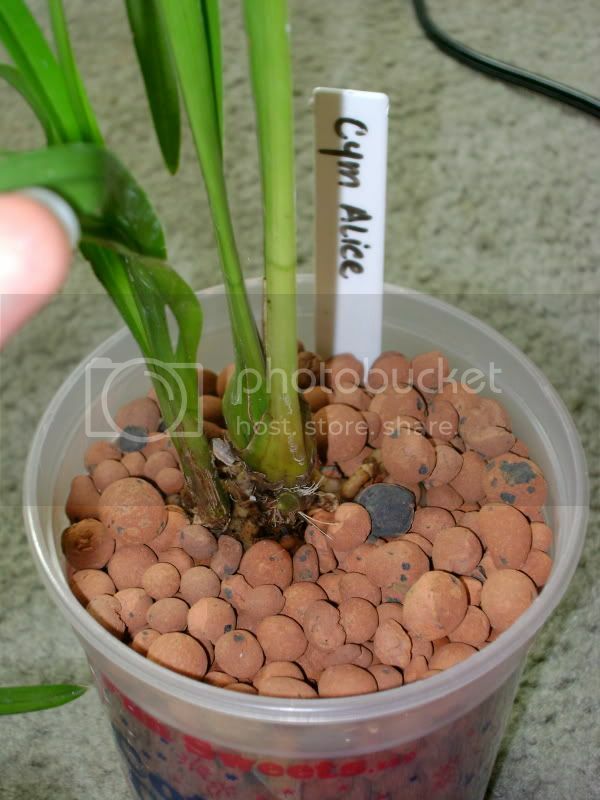 I am considering repotting my cymbidiums to S/H since it seems roots do better that way. Has anyone had success with converting cyms from soil to S/H? Haven't tried that but will follow to see how it goes for you. I have a Cymbidium alifolium in S/H blooming right now. I will get pictures tomorrow. When Cymbidiums are in growth they like a lot of water and do well in S/H. 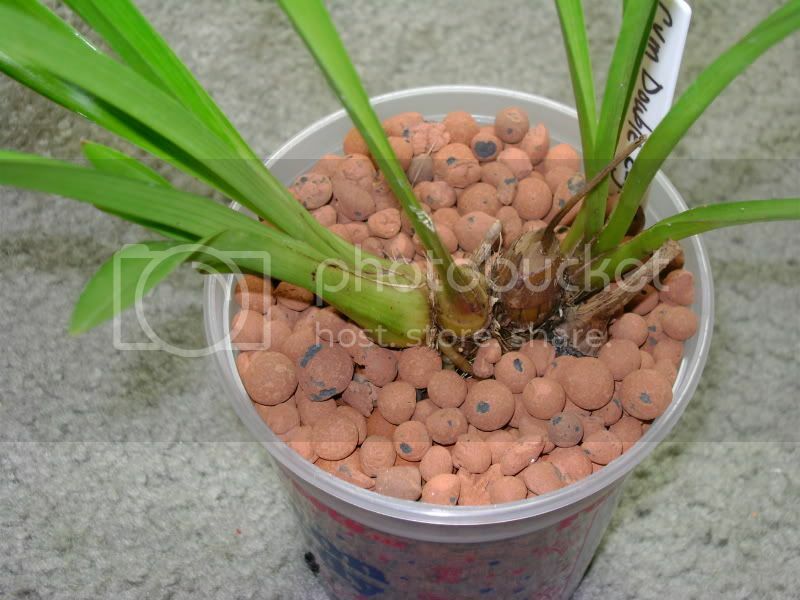 I Just ordered four different types of cymbidium's so I will plant one of them in the S/H and let you guys know how it goes, and I will post pics as well. Can you do the standard Cym's in s/h or just the smaller ones? I seem to have trouble with the "warm tolerant" Cym's so I thought about trying it in the house with the s/h. Here is Cymbidium aloifolium. 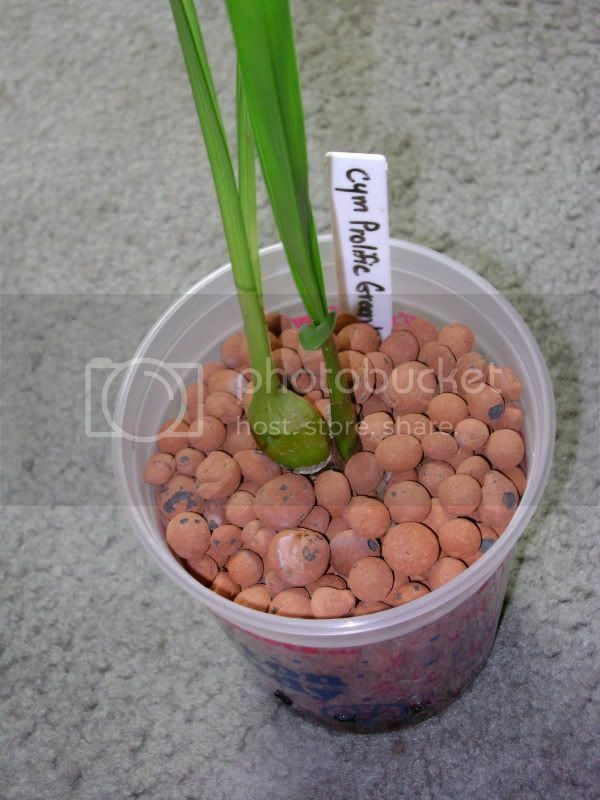 It is a large warm growing Cymbidium. It is outside all winter (40F lows at night). I was moving it last night because of a giant wind storm and found a spike full of flowers hiding. It also has a second spike starting. It is so crowded I'm not sure if it has even more. Pict 1 - Whole plant with a 15 inch (38cm) ruler. Pict 5 - New spike starting. Blueorchid, cant wait to see how yours do. How long has that been in S/H jay? Is it nice and root bound like Cyms like? I got it last July and it went right away into S/H. It is pretty root bound and crowded in there. I took it out of its pot about 2 weeks ago to clean up some dead roots because I didn't think it was going to bloom. As you can see it didn't even bother it since it has two spikes going now. I have 8 Cymbidiums in S/H. One of them bloomed this summer without being root bound. Here in Australia 99% of all orchids are grown in shade houses. Mine is 30% shade cloth, see photo below. Other is of a flower spike growing, the other one is of the flower spikes being staked. In all over 90 stake put in so far. Just how easy it is to grow Cymbidiums in a shade house. In winter when the flowers start to open I will put a clear cover over the top to protect the flowers from rain and frosts! 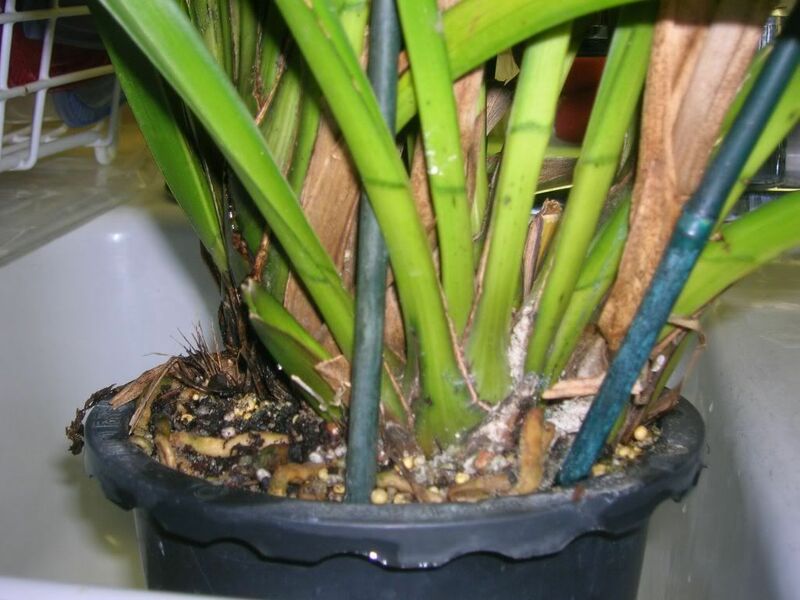 Most commercial potting mixes for Cymbidiums are ok. I just use a 10mm (1/2 inch) mix. Most of it is between 6 to 10 mm in side and allows for good drainage. Beautiful cym Jay!!! I didn't know species cyms would get so large. It is a bit late for cyms to be spiking around here; what a great surprise! Yeah....I was running around the backyard in my pj's last night grouping plants together.....I wasn't expecting that kind of wind this time of year!!! "Women Who Obey Seldom Make History." Wow Ron! Impressive Cym collection! I agree with Louis- Very impressive! Great to see Cyms in S/H I look forward to the mini cyms I have put in S/H doing well. PhalPal - The wind was crazy last night. That is how I found the spike. I was moving plants out of the wind and putting them against the house. I didn't even know it was in spike and it actually had flowers. Wow Jay, your cyms are gorgeous and seem to LOVE the S/H. I am expecting to get my cyms sometime next week and I will definitely be moving them to s/h. one is a mini and the other three are standard size i believe. I will keep you guys posted with pics once i get my cyms, CAN'T WAIT! I believe you can do either the standard or the mini from the research I've done. 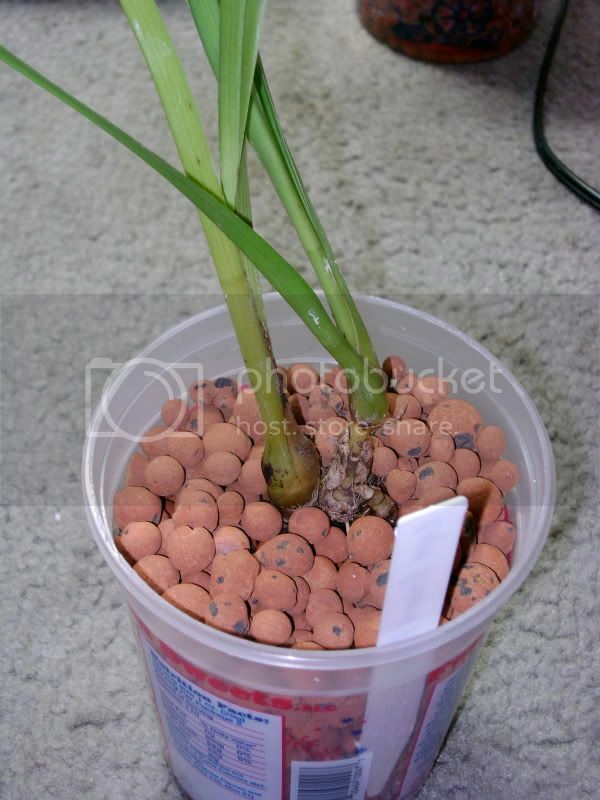 I know for cyms the s/h pot has to be tall so that the root can "dive deep". Sorry it took so long for an update but my pics are too large for this site and I was trying to figure out how to reduce their size. I'll give you the direct link to them. These are the cyms I ordered, they are young and they came in little square black pots. They seem to be enjoying their new s/h home. I'll keep you updated. They look great. Now I can't wait to see blooms. If you have a pc, you can open the picture in windows picture gallery (should be installed if you have windows) and at the top click edit. Then on the side click compress, check the for web pages button and then just save. I usually save as and rename so I have the original size picture as well. The do look very good. For most of my pics I just set my digital camera to shoot in 680X480 pixels with regular grain, rather than fine or superfine. But if you're using photobucket you should just be able to click on the "insert image" icon in the editor and supply the URL that links to each picture. Good luck on the S/H! I'm trying to get all of my orchids in S/H and the one's I've converted already seem to love it! Never felt better, had more or wanted less in my entire life! Thanks, I didn't think of that I will go into my digital camera and set it to take lower quality photos. And yeah the orchids really do love s/h. i've done some of my other orchids in s/h like my cattleyas and they start giving me so much new growth. As for the cyms, they are still doing great and one of them is shooting out some new roots. I will give a pic update maybe sometime in the next two week. Have you any updates on those cyms? I would like to try moving some of mines in s/h after flowering, but i love them so much wouldnt want to loose them. At what time do you switch them over to s/h? I have one thats so tight in the pot I cant twist the posts the prev. owner used to train the flower spikes. It has 4 new PB's that are 1/2 the size of the mature growth. I cant tell if the roots are in active growth now or not. cyms stop growing end of autum.flowering for cyms are winter and some in spring.in spring cyms start to grow again. Every cymb I get goes straight into semi-hydroponics. The suckers burst through the pots in no time. I tried growing in my sh but did not get good results until I moved them out where they could get direct sun, except noon sun, then they started growing and blooming for me. I am new here but i am very happy with my sh cym.I have one cym in the house in sh, as an experiment.It was somewhat dehidrated, but with some new growth, and now is looking better.It looks less shriveled and happier, and i am sure he likes it.When the other ones will finish blooming, i will convert them to sh., as i have my phals in sh, 30 of them, and are doing great.